History repeats itself, especially in economics, and here’s what I want you to know about centralization, decentralization, and money. A crypto-focused conference taking place in a former communist country wasn’t lost on me, especially given the financial history of the Czech Republic. Back when it was Czechoslovakia, during USSR communism, the Czech koruna (crowns) were nefariously re-valued, pointing to the local market to rubles overnight in 1953, instantly devaluing the local currency and reducing people’s savings accounts by as much as 50-to-1 (through 10-to-1 was standard). Imagine if tomorrow your dollars weren’t worth as much as they are today. The only consolation was that everyone was in the same boat, which was the communism in practice consolation prize in general and generally didn’t cut it for folks. A few years later, Tuzex vouchers were created as a currency to use in “Tuzex stores”, a place where you could acquire Western goods and export-quality local goods. These stores took non-USSR currency as well as the vouchers (called “bonds” or “bony”). Multiple currencies were in play, and about 10 years into communism healthy grey (tolerated) and black (illegal) markets had emerged to exchange crowns earned in after-work jobs, bony, and illicit cross-border currency movement for goods and services. 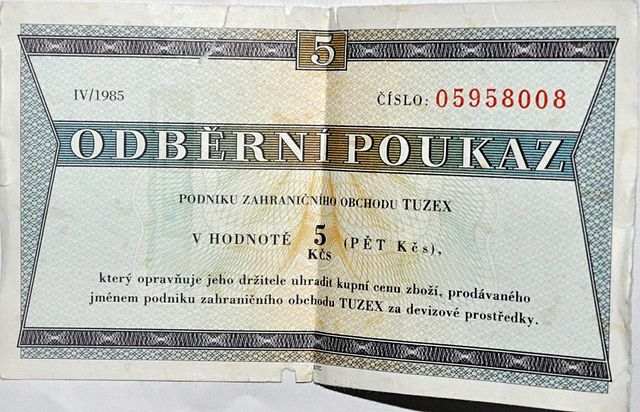 The official koruna, in which people were paid and that was accepted at most stores, synced with the USSR’s currency; and the higher-valued bony, which got you better stuff – but only at one store, or if you traded it with others who might want stuff at that store. A multiple currency situation isn’t ideal for regulation or taxes, though it seems to be fine for the ways economies work. People trade with other people, and it only matters that the traders agree on the value of the thing that’s in exchange. A key idea at the conference among the people in conversation there was the concept of value and exchanging value. Think back to the communist multiple currency situation, or to any time you’ve travelled internationally: some currency has more value than others. Crypto, digital assets that have value, is similar. Much like you could in the past trade bony for export-quality chocolate or today trade dollars for a delicious coffee, crypto is in a lot of ways no different than the venmo-ing and paypal-ing you might do — it’s just an invented currency, and different tokens (called coins) have different exchange value. My cryptolord colleagues love the free market, hodl-ing (that is, saving and not selling) crypto coins, and some are crypto wealthy. One of the many blockchain afterparties I went to had $100 USD and Euro bills printed up and laying around on the ground, to symbolize the money that is flowing in this ecosystem. I grabbed a stack and threw them in the air, delighting in the seeming abundance. (It’s the opposite of working in a nonprofit and I find it fascinating.) The money wasn’t “real” but neither is crypto money. Except, when it is. Creating currency forms for trade is not new either: for example in Ithaca there’s Ithaca Hours, a kind of barter/timebanking tool which locals have used for over 25 years and comes in $10 vouchers. Bony got made up so people could exchange for items of higher value in their economy. When I was a kid I got these little tickets I could exchange for lunch at school, and folks who get WIC have paper vouchers a grocery store will exchange for food. There are already forms of value exchange that are not federally-backed currency, many of which never need to interact with what crypto enthusiasts call “fiat” currency to be of use. Another key idea in crypto, but even more in the underlying technology is decentralization. The economic application of decentralization is the idea that banks and governments can’t be trusted, and therefore autonomous systems should replace them. Standing there in the Czech Republic, on one hand I couldn’t argue. Central systems under communism MASSIVELY failed the people of that country and many others. There are two logical issues with decentralization. First, the failure of one system doesn’t automatically mean the opposite is correct – just because communism and central planning was a disaster and because late stage capitalism is a coverup for corporate interests doesn’t mean we should dismantle all banks and governments and do everything individually, for example. Second, decentralization in practice isn’t really happening, even in crypto. The interfaces are so freaking convoluted that only the most committed cryptolord and tech nerds (nerdier than me by far, god bless ‘em) use the extremely networked, not-owned versions of the technology. Many instances of the tech route information or ease user experience by using centralizing servers, data and exchanging money in an exchange is still critical to the crypto trading market – and very centralized with a few platforms. Centralization is not all bad, just like decentralization is not all good – both serve purposes and both can go to ridiculous extremes. I don’t want to live under communist central planning any more than I want to live in a way that forces me to set up my own utility services. The logical extremes of both are inefficient and leave people out. We’re at a super interesting time in history when a huge experiment in money is underway — one that will try to push back on the oligarchy of banks and the supremacy of government-issued and controlled money. The concepts are not new, though the impacts might be. Frankly I learned a ton from the conversations I had in Prague, especially with folks I might not fully agree with but who I respect as vanguard players. You might even want to try trading crypto (but remember, only put in money you can 100% afford to lose, and think of it as a way to learn – it’s NOT investing!) Coinbase is one platform that eases the complexity of the process of getting bank money / dollars exchanged into crypt. Options like MetaMask help if you want to trade Eth (or play games using it – see CryptoKitties), and MyCrypto lets you create your a wallet to hold/transfer funds from.